So at least for me it's been difficult to tell exactly where Preoccupations have been going with their music. The transition from the crushing, grinding riffs of Viet Cong to their self-titled record under this name came with a sonic shift towards a more synth-infused, drone-like post-punk that was brighter and didn't quite feel as implacable as their debut, or as wiry at tight as what most of the group was doing with their previous band Women. And yeah, it wasn't a bad shift but it led to tonal choices that didn't always seem to cleanly match their compositions - a potent listen, but misshapen around the edges, and definitely transitional. But it looked like Preoccupations was going to keep on shifting, with the songwriting turning introspective and the tones reportedly sounding even brighter and more melodic. And I'll admit that I wasn't at all sure how this would turn out - part of losing that impact was why their last record hadn't resonated quite as well, and while there had been some influences reminiscent of The Cure I didn't exactly see Preoccupations making any strides towards pop. But hey, if this was a record looking to hit rock bottom with better tunes than ever before, I'd give it a listen, so what did I find on New Material? 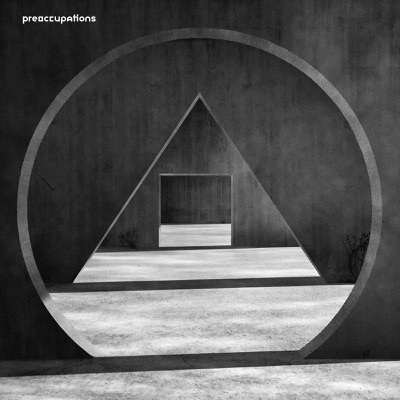 Okay, here's the thing: I suspect what Preoccupations is doing with New Material may alienate some fans and hold-overs from their earlier, more guitar-and-groove driven post-punk, because this is decidedly a different slant upon that material across the board. It's not nearly as ponderous or dark or heavy in the conventional sense, and you'd think that given the writing style and thematic arc hasn't changed that much you'd think it'd be a downside... and yet I'm here to tell you that not only did Preoccupations make their most accessible record to date, it's probably their best, the best sort of blissed-out peaceful apocalyptic nihilism I've heard all year. And describing why it clicked for me so well comes in a fundamental change in sound and approach. and I'll stress that it didn't come immediately, mostly because there were definitely points where I was waiting for the basslines to hit harder or show more prominence and development within the smoky clouds of guitar-feedback and glossy swells of warping synthesizer - which the band had admitted at some points is pitched and lowered to sound almost like guitars on tunes like 'Decompose', where the only guitar is a sample. And that is something I admire about this production, how despite the usage of samples in guitars and vocals it blurs together to flood a swollen, cavernous mix, punctuated by booming percussion and Matt Flegel's curt, nasal delivery. And despite percussion that might almost feel industrial on a song like 'Espionage' or accenting the desaturated goth rock of 'Doubt', it doesn't feel clipped or out of place in the mix - and that's not saying there aren't jagged edges like with the mutated progressive swells of drums on 'Manipulation' or the clicking, increasingly fragmented mix on 'Antidote' or the thunderous, overwhelming swell of noise on the closing instrumental 'Compliance', but that they fit the weathered, almost old-school post-punk production depth. I've made comparisons with Preoccupations to Echo & The Bunnymen and The Cure before, but especially with the brighter tides of ragged synth on songs like 'Disarray' it's much more reminiscent of the more opulent edges of post-punk that would ride out of the weirdness towards new wave in the early-to-mid 80s, analogous to Joy Division shifting into New Order, especially considering Flegel is embracing more conventional singing with the grooves instead of his clinical snaps alongside of it. And when you also consider that these compositions are easily Preoccupations' most tightly written and economical to date, it's hard not to feel like steps towards glossier synthpop are surprisingly good for them. But here's where things get interesting: when you also realize that there's an embrace of more major chords and brighter synths, that naturally drives a shift in how one will take the lyrics, which in the tradition of Preoccupations are clinical, fussy in an oddly technical way, and absolutely focused on a downbeat, almost oppressive brand of nihilism that if anything is coiling further inwards than ever before. But now instead of playing the exasperated accountant of everyone's impending doom, there's a sense of bone-deep, tired resignation that has sunk in and through it you're seeing the most human and relatable side that the group has ever brought to the table. Take 'Manipulation' - it's not the first time that Preoccupations has written about someone being manhandled by another, be it the larger system or otherwise, but with self-awareness he can now clearly eye his manipulator and ask to be seen as more, not just with the resentment he can't quite shake. Or take 'Espionage', which uses harsh language to match harsh production as he's being brought down... to the level of everyone else, and engaging in the sort of human emotions and social interactions to which the band has somewhat kept at arm's length - and yet their release leads to some genuinely startling moments. I love how 'Decompose' is so frank in how against the surging course of time we break down and are cursed in the ways we tend to be - the difference here is that they find some vestige of inner peace in accepting it with the faint hopes in what we leave behind will find resonance. I'm reminded a lot of the best moments of Sun Coming Down by Ought, which in the face of corrupt but fragile systems of human behavior - most of which only stand because on some level we prop them up - we can find release in the subtlest transgressions like on 'Disarray' or just standing firm as it all collapses around us like on 'Solace'. Hell, it even ends similar to Sun Coming Down with 'Doubt' and 'Compliance' showing some vestige of acceptance within that system, some being hardwired within us but more with an acknowledgement of human fallibility. Even if the worst among us will send 'current down barbed wired' - fantastic symbolism there - and we are certainly big enough to impact change, it's our lot to face a slow decay and reaching an understanding of that allows some vestige of inner peace and serenity. So yeah, nihilistic for sure, but it's meditative with it in the same way that great atmospheric black metal can be, and once I clued into that mindset, I really came to like this record, a lot. The tonal shift adds a great new dimension and sense of humanity to this band that adds texture to the writing and enhances it in the production, and when you pair it with some of their tightest compositions - and the fact that at eight tracks this record's efficiency can't be overstated - New Material is a great step forward for this band. For me it's an 8/10 and definitely a recommendation, especially if you like vintage post-punk and might have felt let down by that last Ought record - this will definitely be more up your alley. Fine work, gentlemen, and everyone else... yeah, make some time, check this out!